The Legal Genealogist is a huge fan of JSTOR, the digitial library that serves as a front end for access to academic journal articles, books, and primary sources in a whole range of disciplines. No, it’s not free — it’s even downright expensive compared to some other services, at $19.50 a month or $199 a year, discounted for new users to $179. But it’s worth it when you’re doing lots of research on esoteric topics. 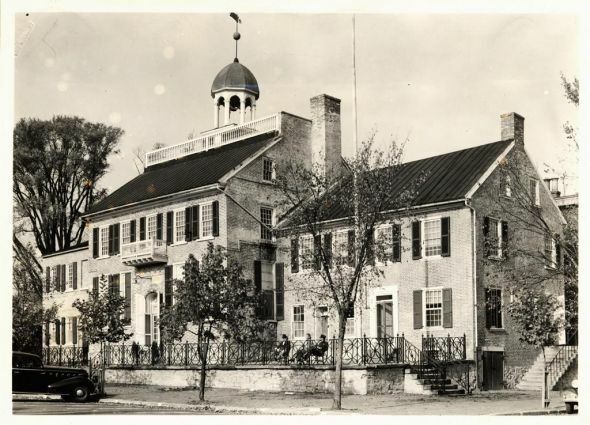 Well, I did a search for “courthouse” and got 201 images ranging from the New Castle Courthouse in Delaware, photographed in the 1930s and in the Special Collections, University of Delaware Library / Newark, Delaware (pictured above), to the Royal Courts of Justice Law Courts in Edinburgh. Artstor — http://www.artstor.org/ — free access to images we can use. Authors and their heirs see not a penny of what it charges for viewing publications that are still in copyright. Since 1966 I have published scores of articles in academic periodicals, many of them available on JSTOR, yet my permission was never asked (and, therefore, never given) and I have not seen one cent of what JSTOR has earned from MY hard work. That’s certainly something to take up with (a) your journal publishers first and foremost (since they undoubtedly have the contract with JSTOR) and (b) JSTOR itself. Sounds like a great asset. I agree with you about JSTOR and in Australia, members of our national library (free to join) are entitled to free access to JSTOR. I wonder if that might be available through some US libraries? Pretty annoying that authors get no benefit from it though. Yes, some US libraries do have agreements with JSTOR, and particularly academic libraries. As for authors, any author who owns his or her copyright (and didn’t transfer rights to the publisher) and whose article is being republished and who isn’t getting paid needs to take this up with JSTOR and the journal publisher for sure.